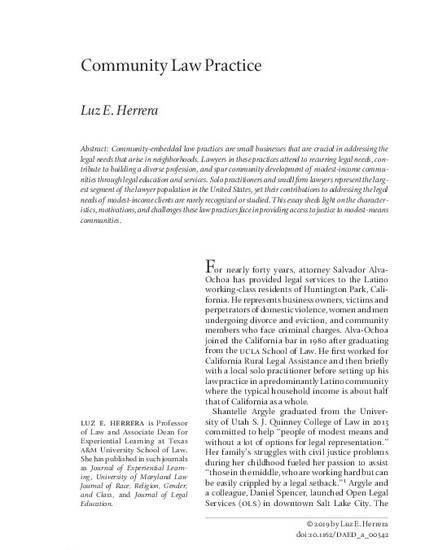 Community-embedded law practices are small businesses that are crucial in addressing the legal needs that arise in neighborhoods. Lawyers in these practices attend to recurring legal needs, contribute to building a diverse profession, and spur community development of modest-income communities through legal education and services. Solo practitioners and small firm lawyers represent the largest segment of the lawyer population in the United States, yet their contributions to addressing the legal needs of modest-income clients are rarely recognized or studied. This essay sheds light on the characteristics, motivations, and challenges these law practices face in providing access to justice to modest-means communities.